Hermit of the Third Order of St. Francis, date of birth uncertain; died at Noto in Sicily, 19 February, 1351. He belonged to one of the noblest families of Piacenza, and having married when he was quite young, led a virtuous and God-fearing life. On one occasion, when he was engaged in his usual pastime of hunting, he ordered his attendants to fire some brushwood in which game had taken refuge. The prevailing wind caused the flames to spread rapidly, and the surrounding fields and forest were soon in a state of conflagration. A mendicant, who happened to be found near the place where the fire had originated, was accused of being the author. He was imprisoned, tried, and condemned to death. As the poor man was being led to execution, Conrad, stricken with remorse, made open confession of his guilt; and in order to repair the damage of which he had been the cause, was obliged to sell all his possessions. Thus reduced to poverty, Conrad retired to a lonely hermitage some distance from Piacenza, while his wife entered the Order of Poor Clares. Later he went to Rome, and thence to Sicily, where for thirty years he lived a most austere and penitential life and worked numerous miracles. He is especially invoked for the cure of hernia. In 1515 Leo X permitted the town of Noto to celebrate his feast, which permission was later extended by Urban VIII to the whole Order of St. Francis. Though bearing the title of saint, Conrad was never formally canonized. 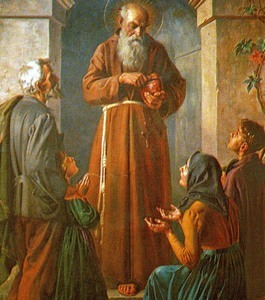 His feast is kept in the Franciscan Order on 19 February.